and serve to your guests on Thanksgiving. The first thing you should know is that I am very creative but not a cook. If it is healthy and can be made using short cuts... I'm all about it. 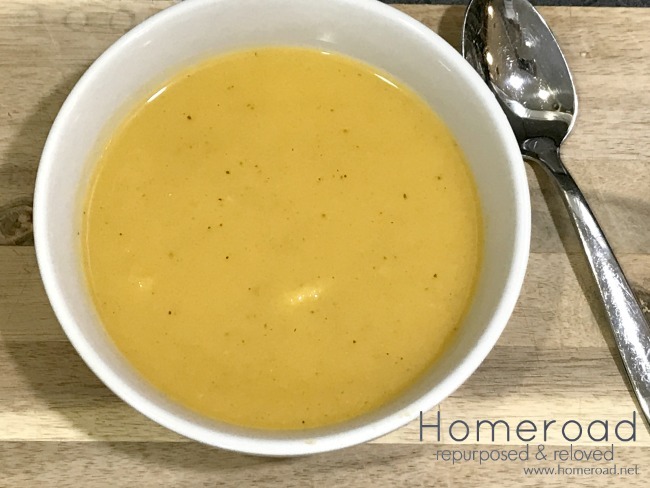 So I want to share this soup recipe because it is quick, easy and delicious. 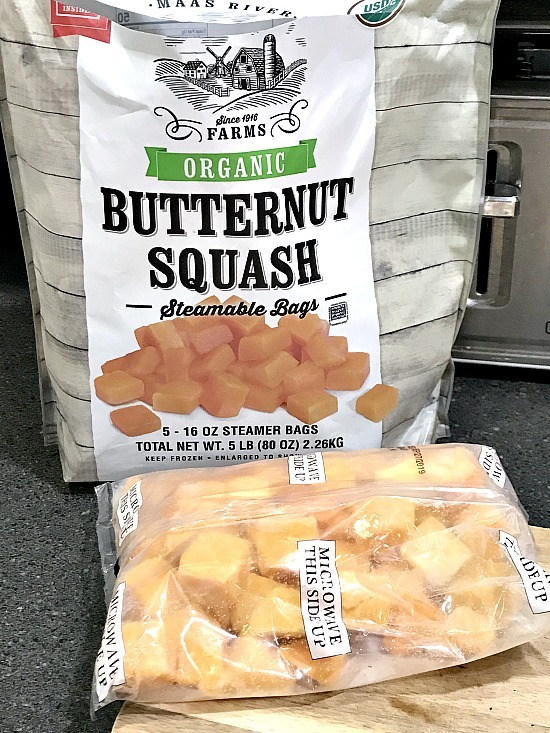 I found this package of frozen organic butternut squash at Costco. I've bought it before and it's delicious. I believe it's only in the stores in the fall because I haven't seen it at any other time. It's great as a steamed side dish too! 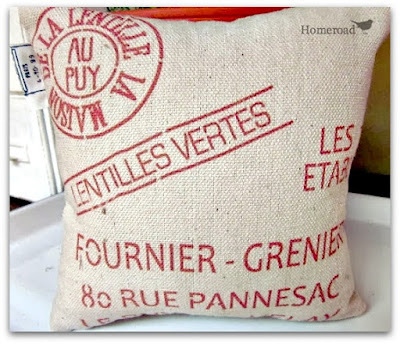 Inside this large bag are 5 steam-able bags... for this recipe I used 4 of them. I began by dicing an onion and frying it in a stock pot with about 2 tsp. of olive oil until glassy. I added 2 quarts of low sodium chicken broth and 4 steam-able packages of butternut squash. I diced up one large Honey crisp apple and added it to the soup. 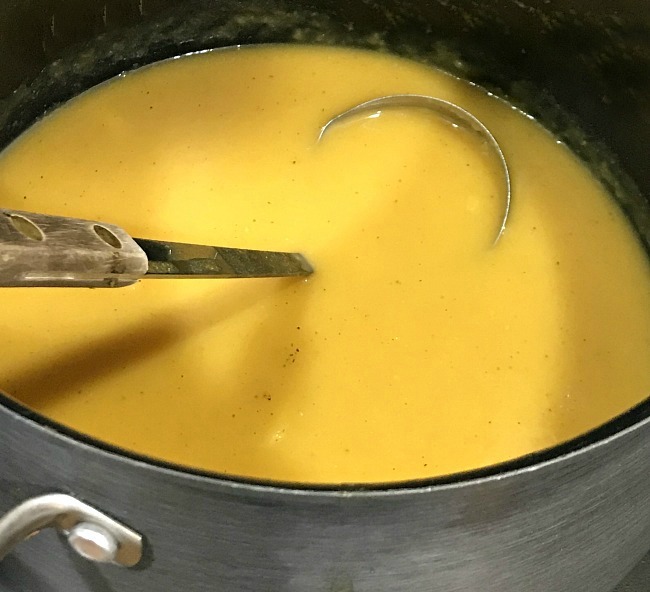 I simmered the soup for about 20 minutes then used a hand blender (affiliate link) to puree the squash and apple right in the pot. I added 1/2 a cup of unsweetened almond milk then seasoned with 1 tsp of nutmeg, salt, and pepper to taste. Optional: I added 2 tsp. 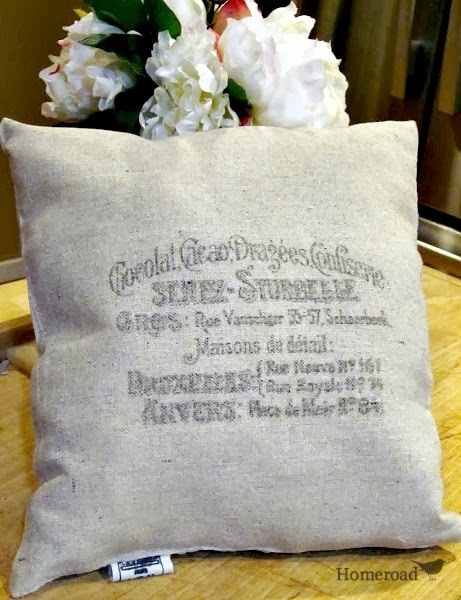 of Stevia to sweeten my soup naturally but you can leave this out or sweeten with a sweetener of your choice. 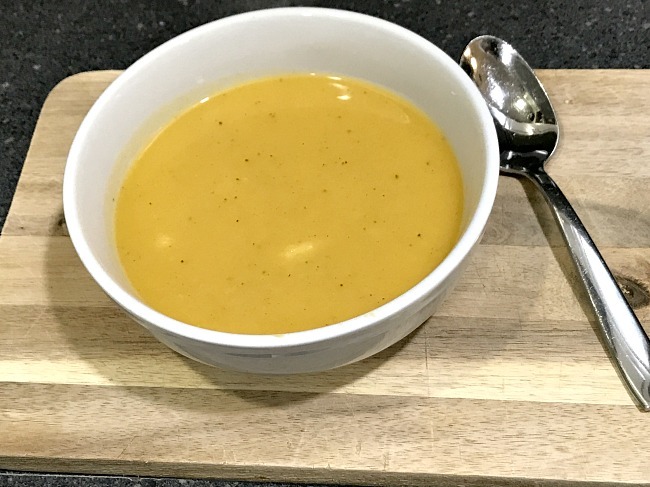 This healthy, low calorie soup was wonderful and buying the frozen butternut squash was a real time saver! Enjoy on Thanksgiving or anytime! And if you are a fan of zucchini bread then you will love this healthy zucchini bread recipe too! This is a winner/keeper. I love soups especially during cold winter days and nights. This soup will be added to my favorite winter soups list to make. Thanks! I'm so glad! You're gonna love it and it is very easy to make... you don't have to go through all the trouble of cooking the squash first!